On Sunday my sister told me the Naughties still didn’t have stockings in a suggestive manner. This was similar to the time that she told me that the girls had a princess party to go to. I thought about just handing her the stockings I made in college that I usually hang from our stairwell as decorations. 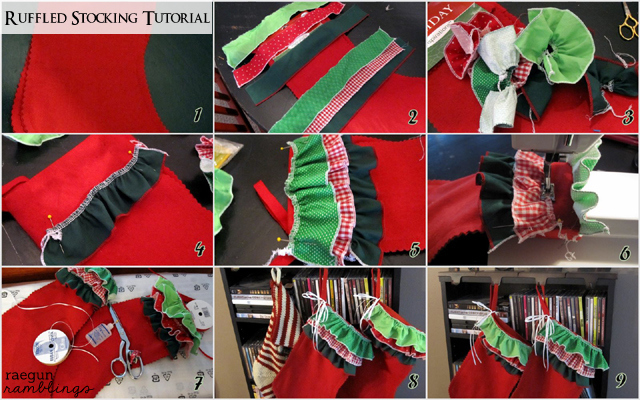 I thought about carefully cutting out felt or layers of fabric and making new stockings for the girls. I thought about all the other things I have to do. But then today while in the 35 minute cut table line at Joann I saw these felt stockings 2.99$ 70% off. So I bought them and dolled them up. If I new where half of my craft stuff was (moving) I would have added some bells but this is what they got. 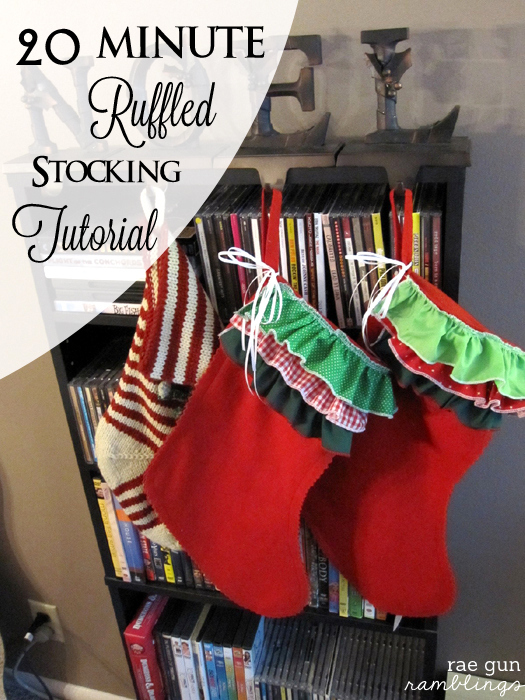 Here’s a cute 20 minute ruffled stocking tutorial. If you want to make your own here’s some easy peasy steps. 2. Cut some strips to ruffles. Mine are finished because they were for my ruffle diaper covers but really for stockings they don’t need to be finished. 5-6. Sew them on, now I work from the top down. 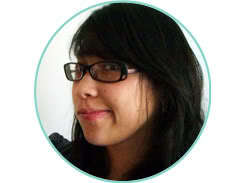 I think all I have left is wrapping and day of cooking, oh I just remembered my wontons. Okay that’s not too bad of a list. Hope you’re all having a good week. Sounds like you’re really well organised girl. I particularly like those stockings…you’ve taken a bland piece and made it into something super gorgeous! So cute!! I’m just about finished with my daughter’s stocking for her first Christmas. Just need to add a hanger and her name. i am a sucker for ruffles! very cute! found you at making the world cuter! So fun. 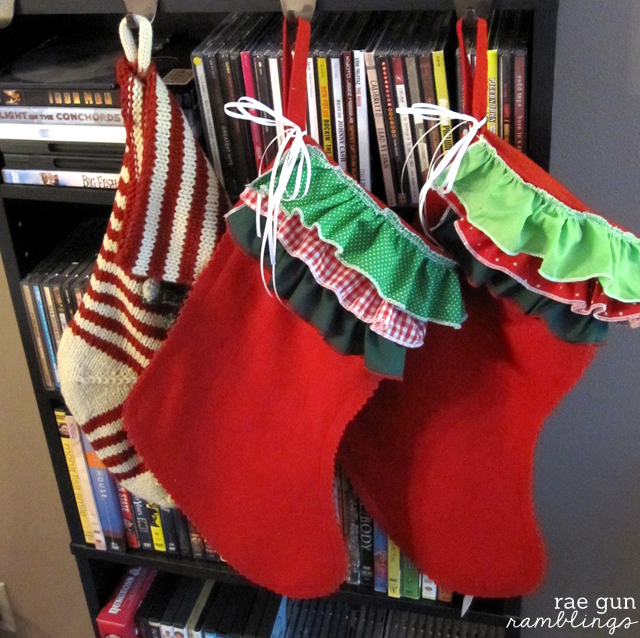 I’d love for you to come by and link up to my Christmas Stocking Linky Party this weekend. Fun stocking! Thanks for sharing. I know my girls would love something like that! !